'Rocket' replica and modern train, c 1980s. Re-enactment of the Rainhill Trials, 25 May 1980. 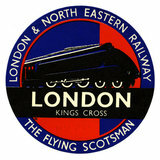 The Flying Scotsman and fans at Kings Cross station. 'Locomotive Engine, 'The Rocket', 1830. A4 Locomotive No 2509. Front View..